Prior to about 1087, Cairo was not really much of a fortified city with its sun dried brick walls, though this weakness had demonstrated itself on occasions. That year, Badr ad-Din el-Gamali, the visor of El-Mustansir, employed three Syrian brothers from Edessa to build the three main gateways of the Fatimid wall made of stone which was to provide fortification. These massive gates are called the Bab (gate) el-Futuh, Bab an-Nasr and Bab Zuwaila. 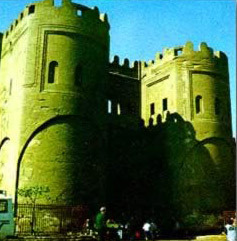 The Bab el-Futuh, or Gate of Conquest consists of a huge vaulted opening carved from a massive block of stone and flanked by two rounded towers. The masonry is considered to be finer than that of the southern gate (Bab Zuwaila). It marks the northern boundary of the old Fatimid City. In past times, the great caravan of pilgrims returned each year from Mecca, entering this gate and making their way to the Citadel. Today, the entrance appears squat, but this is due to the base of the gate being sixteen feet below street level. The interior of the gate is accessible, and one may traverse the wall either on top, or from within to the more eastern Bab al-Nasr.